Tree of Life Jewelry is loved and adored now all over the country and in all different parts of the world. Now you can wear one while also helping to support HD Reach. 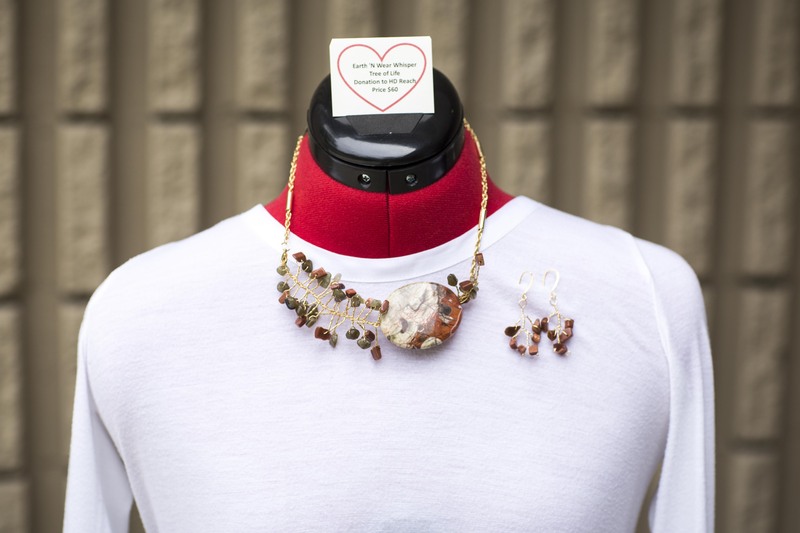 Invite your friends and family to purchase a Tree of Life Necklace, Earrings, or window/wall decoration and help support HD Reach's mission - provide access to care for those affected by Huntington's disease! Terry Buehner, the designer of these unique pieces, has made jewelry for twenty years. These are original pieces of jewelry - no two are the same! We will ship your order within a few days. And remember...all proceeds will go to HD Reach. Jewelry Necklace - ade and goldstone beads which are growing out of a large Mexican Laguna Jasper stone bead: promote frienship, good luck, and reducing stress. Necklace - ade and goldstone beads which are growing out of a large Mexican Laguna Jasper stone bead: promote frienship, good luck, and reducing stress. This Tree of Life necklace combines jade and goldstone beads which are growing out of a large Mexican Laguna Jasper stone bead. Goldstone is a man-made glass bead with copper flakes. Glass is a melding of the four traditional elements because through fire and air the silica earth elements is molten into liquid only to return to its earthy state as a solid. The four elements amplify rebirth, focus, and good communication. Copper is good for circulation and promotes a friendship. Jade is a good luck stone. Mexican Luguna Jasper boosts physical energy levels by reducing stress. - matching earrings can be purchased separately (#Earrings09) .